We’re settling into a routine of making pizza from scratch almost every week. It’s relatively quick and easy to make. I use the basic bread dough recipe from Jamie Oliver’s cookbook, "jamie’s kitchen". W- prefers it when we make a double batch of dough with just one batch worth of yeast, and let the dough rise overnight. This results in these really puffy, bread-like pizza crusts. After the dough rises, it takes me just an hour to prepare four pizzas. I divide the dough into four parts, forming them into rectangles by stretching and rolling them out. I use practically all of the baking sheets in the house. While the pizza crusts rise again, I chop and grate the rest of the ingredients. Assembly is quick and fun, although I still tend to err on the side of loading the pizza up with too much food. 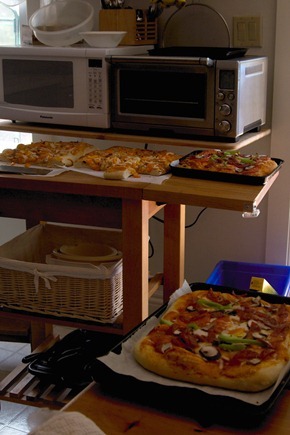 Baking takes twenty minutes per batch of two pizzas, and then we have plenty of pizza to eat through the week. We’re always looking for kid-friendly recipes that we can cook in bulk. Pizza is a great way to use up bits and pieces from the fridge: pepperoni, chicken, peppers, tomatoes, and so on. Other family go-to recipes include pasta and curry. Good to be able to make things ahead! I moved the calendar to the fridge so that we can use it to plan the meals during the week. Another step towards even smoother everyday routines!